Arguably, the most anticipated movie of all time. Actually, no, this isn’t a debate. Star Wars: Episode I – The Phantom Menace, to this day, was the most anticipated movie…ever. Before the internet made videos easily accessible, people all over the world bought tickets to movies just to see the first teaser trailer and walk right back out. Fans camped out days, possibly weeks, in advance to guarantee a ticket for the first showing. Finally, George Lucas was going to introduce us to Anakin Skywalker, the yet-to-become notorious Darth Vader! We were going to get to see the creation of the Empire! Fresh lightsaber clashes and Force pushes! And who was this new mysterious Sith Lord? The reaction, at first, was relatively positive. But that quickly faded, and people all around quickly began bashing the film. Was it because of the let down due to all the hype, or was it really as bad as people were saying? After his last film, Red State, Kevin Smith stated that he was retiring from film making to become a full-time podcaster. The man loves to talk (with at least five different podcast shows, you have to love it) and so podcasting seemed like the next big step in his career. But after an episode of Smodcast with his producer and long-time friend, Scott Mosier, where he told the story of a man looking to rent a room to anyone willing to wear a Walrus costume for a couple of hours a day, a movie idea was formed. He and Scott asked their listeners to tweet #WalrusYes if the movie idea they had discussed was something they wanted to see on the big screen. Their listeners answered and now Kevin Smith returns to film making with his horror-comedy, Tusk. Unfortunately, I didn’t listen to Smodcast when the episode aired. I did download it and check it out once Tusk was already well in to post-production and wondered how the movie version of their story would turn out. It seemed ridiculous and silly. Well, now the film has finally been released. And it is ridiculous and silly. 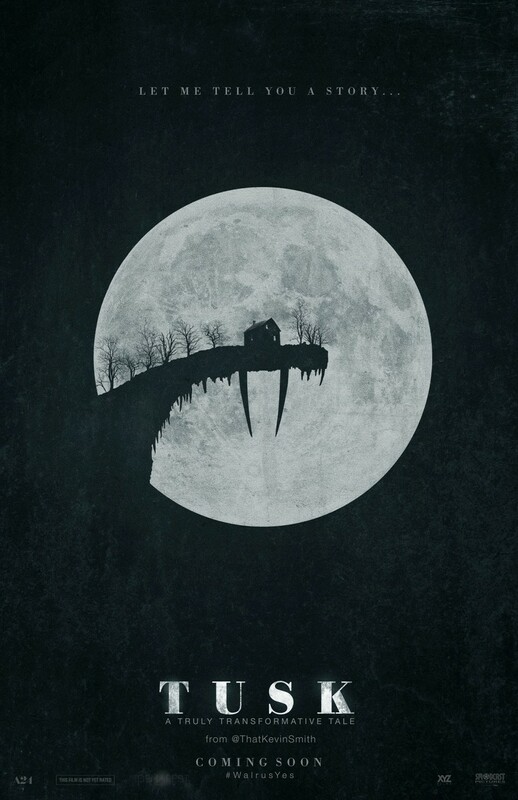 In my opinion, the trailer for Tusk actually does the film a disservice. It makes the film look like a true horror flick. Serious and scary, with just the right amount of Kevin Smith’s brand of comedy. I was excited for this. Smith’s previous film, Red State, strayed from his typical fare, the “stoner” comedy. So with Tusk, I imagined we’d stray even more, into even darker territory. I couldn’t wait to see Smith really push himself and take a risk. We don’t quite get that with Tusk. It’s different than his previous films but Tusk is not a horror film. It’s a comedy. A dark comedy, yes, but a comedy nonetheless. Not to say that it’s a bad thing. It’s just not what I was expecting. The film opens with Justin Long and Haley Joel Osment as Wallace Brighton and Teddy Craft, the co-hosts of a podcast show called “The Not-See Party”. The idea behind the show is Wallace travels to different locations interviewing strange or ridiculous (or internet famous) people, comes back home, and tells his tale to Teddy, who stays at home because he’s supposedly afraid to travel. So Teddy doesn’t see any of the wacky stuff Wallace does. Hence the title of the show: “The Not-See Party”. Kind of a stretch for a silly joke, but whatever. I can go with it. Wallace sets off to Canada to interview a kid known as “The Kill Bill Kid”, who is a fictionalized version of the “Star Wars Kid”. “The Kill Bill Kid” twirls a samurai sword around in his garage like an idiot and accidentally cuts off one of his own legs. But when Wallace arrives, “The Kill Bill Kid” has committed suicide, most likely due to all the internet bullying and unwanted attention he was receiving. The movie doesn’t get in to any of that. In fact, Wallace is more upset about losing his interview than the kid taking his own life. Wallace is a bit of a jerk. So in a cruel twist of fate, Wallace stumbles upon a hand-written ad posted on a men’s room wall, by a man named Howard Howe, who is looking for a lodger to rent a room. He mentions that he has lived a long, full life and has many stories to tell. Well, Wallace is in need of a good story! Little does Wallace know, he is in for much more than he bargained for. The scene between Howard Howe, played by the amazing Michael Parks, and Wallace when they first meet, is mesmerizing. The dialogue is superb. The acting is fantastic. We were still early in to the movie, but I was thinking to myself that this could be my new favorite Kevin Smith movie. Soon, Howe’s true intentions come to light; he wants to turn Wallace into a Walrus. I was digging the movie for quite a while, but eventually it takes a bit of a turn. The silliness of the premise can’t be taken too seriously and Smith reminds us of that when he introduces a character named Guy LaPointe, who is too much of a caricature to be taken seriously. I’m still unsure as to whether or not the identity of the actor who plays LaPointe is secret, so I’ll leave it a mystery (he’s actually not credited for the role. The end credits state Guy LaPointe is played by Guy LaPointe). I was thrown for a bit of a loop by the comedy in the second half, since the first half, while funny, had a more serious tone. I can’t say I didn’t enjoy it, though. Tusk is very entertaining. It’s not a film for everyone. Some folks will hate it and I think those folks won’t be able to see the humor in it. I wish I could say more, especially about the special effects make-up involved, but I’m afraid that would be getting in to spoiler territory and I don’t want that. I think I may need to revisit Tusk when it comes out on DVD. Going in to it knowing what it is might help me appreciate it more. Again, I blame the trailer for marketing it as a straight up horror film. For now though, I give it a B-. Tusk is rated R and is now playing in theaters. 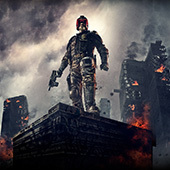 Mega-City One– Dredd. Dredd brings dread. I wonder if that’s how he got his name. 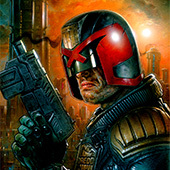 Judge Dredd was introduced in 1977 by a British comic called 2000 AD. Beyond that, we have no knowledge about the character or lore aside from this movie.